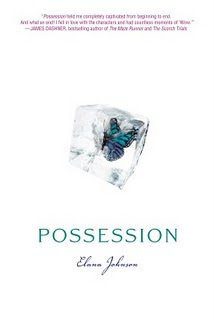 If you haven't heard about Elena Johnson's Possession, you either don't read book blogs, or you've been dead. It's only the hottest book just out. So I joined a blog hop to share in the possession love here. The theme of the hop? A time you broke the rules. To be completely honest, I'm not really a rule breaker. I've always been a 'keep your head down and follow the instructions' kind of gal. But I have broken oh, so, many writing rules, I'm probably even breaking a few right now, this run on sentence for example. So I'm going to go over a few common grammar rules I've struggled with myself. 1. Commas - I still don't have them quite figured out, but there is one thing I can tell you. If your writing a list of things (i.e. hairbrush, comb, and deodorant) there should always be a comma before the 'and'. It's a common misconception to leave it off. DON'T. To read the incredibly funny article about this click here. 3. Capitalization - when should it be used? At the beginning of a sentence - that's a no brainier. When else? The general rule is for a proper noun. Some examples of words you should always capitalize are words like 'Wednesday', 'English', and 'Spain'. Some examples of things you should not capitalize are words like 'him' unless that is the person's title. Also, words that you want to emphasize such as 'cancer'. You should only emphasize with italics. Sound good? Good. What a common grammar rule do you break? Omg, and you caught me again! I emphasize in all kinds of ways mainly because I use italics for quotes. Pfft. You're good. Ooh, I hate netspeak. Yet I use it. Sigh. 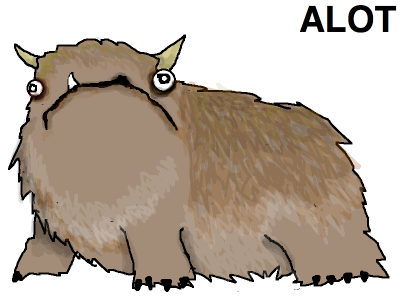 I had an 8th grade English teacher who lectured us for an entire hour about probably using "a lot" instead of "alot". Pet peeve she had, I guess. I've never been good with the semi-colon, but the thing I've gotten lazy on as I've aged is using "But" and "And" to start a sentence...I cringe everytime I do it. I don't break too many grammar rules, though I confess that I do sometimes choose to do so for effect in my writing. Capitalisation is one thing I like to use randomly to make a point. I hate 'alot'. And I've clearly been under a rock because I haven't heard about Possession. Off to rectify that now. Thanks for the grammar tips. Would love it if you continued doing this in the future. English 111 was a long time ago for me. Lyn - welcome back to the real world, you're welcome. Michelle - I do that too! I just think, I'll change it later. we'll see if that ever happens. Robin - On man! I've done that too, telling someone there wrong only to find out I was, not fun. Although I will be guaranteed to never make that mistake again! Ah, the semicolon; I love that thing. I would use it every other sentence if no one complained. Alas, they do. I mess around with grammar rules a lot. I'm never really sure where paragraph breaks should be; I figure wherever sounds right is good enough. One thing I always notice and catch myself doing too, is mixing up there, they're, and there; they're easy to confuse when you're typing fast. Also, every time I type its or it's I have to sit back and make sure I used the right one. I am with Robin. I am a CAPITALIZER which evidently doesn't work in books. I had to go through all my WIPs and change it to lower case italics. Le sigh. Good rule breaking! I do have to look up comma rules once in a while. I do know the one you mentioned, but other times I get confused. Like do you need one before you use too, too? My big thing is exclamation marks but I think I can get away with it because I'm an energetic talker. Way to rationalize, huh? I also get mixed up on if I should put the punctuation before or after the parentheses. It sometimes just doesn't seem right to put it in them. Hi, I came via FYBF at Glowless`s. My grammar is atrocious. In fact if you ever read my blog you are probably going to want to tear your hair out. I never put a comma after the word before the and- I have seen it done but I honestly thought this was a personal choice thing. I use alot and a lot - a lot. Also like Melanie above, I overuse exlamation marks and "..."
The ALOT blog post is one of my absolute favourites of all time!